Qualcomm Centriq 2400 Arm SoC launched at the end of last year, and with its 48 custom 64-bit Arm “Falkor” cores is optimized for datacenter workloads. But what everybody wants to know is whether it will run Crysis Angry Birds. 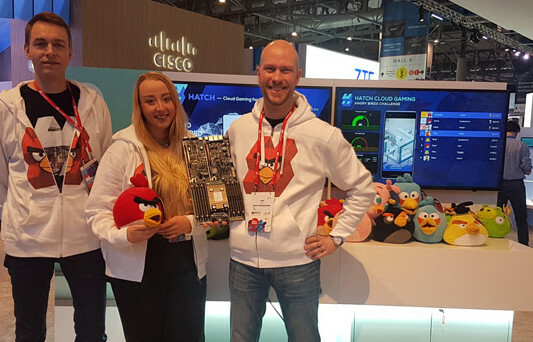 And the answer is a resounding yes!, as Rovio’s subsidiary HATCH collaborated with Qualcomm to implement cloud gaming for mobile using Centriq 2400 based servers. The solution has the advantage of not requiring any additional downloads or installations after installing HATCH since everything is stored in the cloud, which also mean you’ll always get the latest version of the games. The game logic runs on the server, while the mobile phone takes user input in real-time, and the server can deliver 60 fps gaming for half the bandwidth required by HD video streaming. The company is now showcasing their solution at Mobile World Congress 2018 with an an early preview of the Hatch multiplayer edition of the original Angry Birds in Qualcomm area of the exhibition. Other premium games from over 100 developers and publishers are also available on the platform, including Bandai Namco’s PAC-MAN CE DX and Ubisoft’s (Rayman Fiesta Run). The beta is out in over 16 countries – but not where I live – so you can try it out, and based on the video below it’s supposed to work on Android, iOS, and other operating systems.